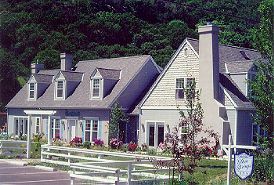 Lithia Springs Inn is a "Country Inn" in the old style of lodging. All guests are invited to make themselves at home in the Inn's common areas, whether it be browsing through the many books in the Library, nibbling on a cookie from the cookie jar in the Dining Room, or relaxing by a cozy fire in the Piano Room. Lithia Springs Inn bed and breakfast is located on a unique geographical wonder - a natural hot spring. So, when you bathe at Lithia Springs Inn you bathe in these relaxing, warm mineral waters. We boast of fourteen rooms, each with it's own private bath. Twelve of those have Caldera Spas. Lithia Springs Inn is located one and a half miles from downtown Ashland, home of the Oregon Shakespeare Festival, Oregon Cabaret Theater and some of the finest dining in the Northwest.